Source: C.W. 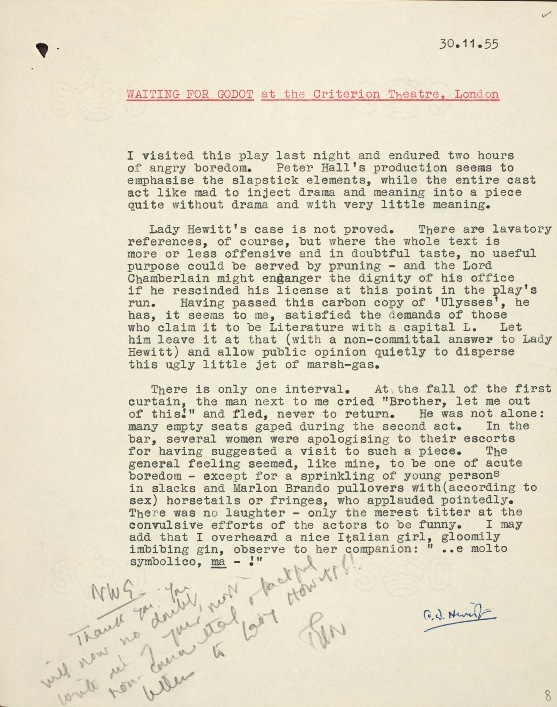 Heriot, ‘Waiting for Godot at the Criterion Theatre, London’, letter 30 November 1955, included in Lord Chamberlain’s Plays: Correspondence file for Waiting for Godot by Samuel Beckett (1954), Lord Chamberlain’s Office, papers held by the British Library, LCP Corr 1954 No.6597. © Crown Copyright. Reproduced here under an Open Government Licence. Text: I visited this play last night and endured two hours of angry boredom. Peter Hall’s production seems to emphasise the slapstick elements, while the entire cast act like mad to inject drama and meaning into a piece quite without drama and with very little meaning. Lady Hewitt’s case is not proved. There are lavatory references, of course, but where the whole text is more or less offensive and in doubtful taste, no useful purpose could be served by pruning – and the Lord Chamberlain might endanger the dignity of his office if he rescinded his license at this point in the play’s run. Having passed this carbon copy of ‘Ulysses’, he has, it seems to me, satisfied the demands of those who claim it to be Literature with a capital L. Let him leave it at that (with a non-committal answer to Lady Hewitt) and allow public opinion to disperse this ugly little jet of marsh-gas. Comments: C.W. Heriot was an Examiner for the Lord Chamberlain’s Office, which served as official as official censor for all public performances in Britain until 1968. The Office had issued a licence to the production of Samuel Beckett‘s play Waiting for Godot, but was responding to a letter of complaint from Lady Dorothy Howitt. The mention of Ulysses is because an earlier note in the correspondence refer to Beckett having been a secretary to James Joyce. Peter Hall‘s production of Beckett’s play had opened at the Arts Theatre, London, in August 1955, but the correspondence refers to its subsequent staging at the Criterion Theatre, London. Peter Woodthorpe played Estragon but various actors played Vladimir during the run. Peter Bull played Pozzo.